Check out those 3.5″ X 5″ real wood picture frames. Note the smooth, graceful curves of the frame on the left and the timeless straight lines of the frame on the right. Classic backing design. All three frames just 10rmb! No, this is not a catalog. But can you believe that?! 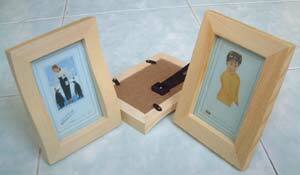 Only 10rmb (US$1.25) for all three frames. I don’t know who decided that in the USA frames are allowed to be expensive, but it’s not right! Speaking of frames, let me change the subject to music. Recently I was investigating what music is currently popular in the States. You know, I’ve been in China for some time now, but I still maintain a scholarly interest in the evolution of contemporary American pop culture. (Ha! Actually, I was starving for new music…) I’ve been meaning to check out more Gorillaz songs off the first album (besides Clint Eastwood), so I snagged a few of those. I also saw that a new band which calls itself The Transplants has gained some popularity in the past few months, and I caught their tune Diamonds and Guns through Shoutcast.com. Man, I can’t get enough of this song! Their other songs are good too! Admittedly, I’m a Rancid fan, but this stuff is different, and good. The punk/hiphop/rap/metal fusion style reminds me a little of Gorillaz. I just wish that it wasn’t so hard for me here to come across new bands like this.